Probably one of the greatest pleasures in life that you get to experience on a daily basis would be, sliding into your comfy bed after a long day. And when your bed is accompanied by soft, crispy, and comfortable sheets, all the hardships you went through that day wouldn’t matter anymore. But, do sheets really matter that much? Absolutely! Read our latest guide about the best satin sheets. How many times have you jumped in a hotel bed, tucked yourself in those comfortable sheets, and wished you had such amazingly comfy sheets in your own bed at home? It is a fact that we spend about a third of our life in our bed, between our sheets. So, sheets do matter, and since they come in direct contact with your skin, choosing the best one is extremely essential. However, there is every chance that you will be thrown for a loop when you go shopping for sheets, because of the many varieties you come across. Let us make it easy for you; if your description of sheets would be soft, classy, refined, and crisp, then percale sheets are the way to go. Sheets that come with a type of weave called percale are percale sheets. It is the weave that gives these sheets their name and not the material. The percale weave is quite simple and plain, with a crisscross pattern, in which one thread goes over and one under, widely referred to as the “one-under-one-over” pattern. Percale sheets are highly durable, cool, crisper, and have better breathability. 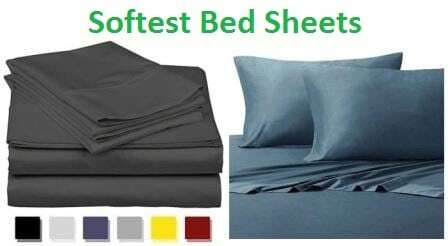 All of these characteristics together make these sheets the best choice for most people, and are therefore known to be the most popular sheet type. Percale sheets are often compared with sateen, a material known for its luxury qualities. Though both these fabrics are commonly made from Egyptian cotton of the same quality, they don’t differ a lot in terms of their characteristics. While sateen is a smoother material and is shinier, percale, as mentioned before, is lighter and crisper and more matte in appearance and texture. This subtlety of percale is what makes it loved by many individuals who are not really a fan of shiny sheets on their bed. The construction of percale is something that makes the weave unique from other types of weaves used for sheets. As discussed earlier, its construction involves the weaving of threads in the format of one-yarn-over and one-yarn-under, and the weaving is tighter than that of many other weaves. The major benefit of a tighter weave is that the sheets feel much smoother, and with percale sheets, you get to enjoy softer sheets with every wash. In order for a percale sheet to be considered original, in the US, it should have a minimum thread count of 180 woven in one direction per square inch. Percale sheets are typically made from 100% cotton due to the fiber’s breathability, which enables it to handle the tight weave to achieve percale. However, when the thread count goes higher, say above 400, the fabric is likely to wrinkle due to the presence of dense threads. To prevent this, manufacturers of percale sheets combine cotton with other wrinkle-resistant materials such as silk, polyester, etc., and this enhance the quality of the sheets further. If you are looking at percale sheets, then you probably need sheets that can keep your body cool during the summer months. In that case, avoid those that have the words brushed or combed cotton on their label. These sheets usually tend to be warmer and therefore will not serve your purpose. When it comes to thread count, it is natural for you to be drawn toward those sheets in their 1000s. Such sheets will be treated with other materials like silicone to make them feel softer; however, they are likely to get rough after a few washes. Therefore, stick to the mid-range in terms of thread count, say between 300 and 500. After all, percale sheets are known for their crisp nature and that is what you are meant to feel. Read our complete guide about the best bed sheets. When it comes to caring for your sheets, your regular process is likely to be something like this: you throw the sheets in your washer, choose the warm or hot setting (because you need to kill those germs! ), add your regular wash detergent, and not to forget, that sweet smelling fabric softener, and let it run. Of course, once the sheets are washed, you will toss them in the dryer to save time, fold it, and put it away until next use. You can choose to either machine wash your percale sheets or have them professionally laundered instead. When washing the sheets, you can choose warm or cold wash cycle; for rinsing, use cold water. You can use your regular laundry detergent, the ones with no fabric softeners, to wash the sheets. The quantity should be just 1/3rd or 1/4th of the actual amount recommended on the detergent box. To maintain the longevity of your percale sheets, DO NOT use bleach. Avoid using fabric softeners on your percale sheets. Make sure there is no soap residue left behind on the sheets, because it will make them feel scratchy. If you notice soap residue after a wash, go for a second rinse. While the ideal way to dry percale sheets would be to hang dry them on the line, most manufacturers today allow the use of dryer in low temperature setting. Unless otherwise stated on your sheets’ label, you can use the low temperature or permanent press setting on your dryer to dry the sheets. Never use high heat setting, because it will completely damage the fibers and the sheets will lose their softness. Remove the sheets immediately after drying. If you wish to iron your percale sheets, make sure they are still damp, and use the linen or cotton setting on your iron. If you are quite old-fashioned when it comes to your sheets and prefer your sheets to feel like the one you slept in at your grandma’s place, then percale sheets should be your choice. Or let’s just say, you need something decent looking, without too much detail or bells and whistles, one that doesn’t easily pill or gets uncomfortable to sleep on after a few washes, again, percale sheets would be the best option for you. Their lightness, long-wearing durability, high quality, and obviously, their crispness are few of the special aspects that attract a lot of hom eowners towards these sheets. Percale should be the sheet of your choice if you love something silky, luxurious, crisp, and cool under your skin every time you lie on your bed. 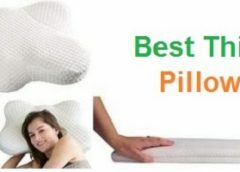 Their lightness and softness make them an amazing choice to achieve maximum sleeping comfort, which is exactly what you will need after a tiresome day. These characteristics also makes handling them easier, and the use of fine cotton, with such tight weave, to make these sheets makes them last long as well. Though they are priced a bit high that your regular bed linens, they are completely worth the money you spend. Unfortunately, unlike some other products, you cannot try out percale sheets from different manufacturers to find the one that you like and suits you best. Yes, you can ask for recommendations from family and friends, but if you rely on reviews, here we have shortlisted and reviewed some of the best percale sheets you can find. Established 12 years ago, Thomas Lee is now one of the popular brands in the luxury sheets industry, aimed at providing quality percale sheets for their customers all across the country. What makes this brand unique is that they bring their products directly to consumers, which enables them to eliminate the otherwise high markup. As a result, Thomas Lee percale sheets are competitively priced and there is no compromise over quality whatsoever. 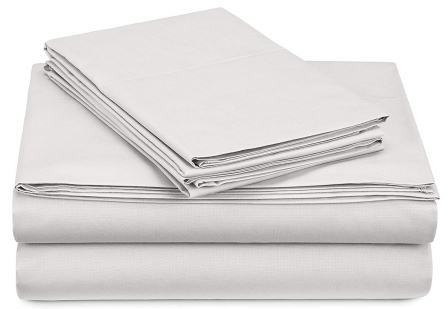 This 500 thread count percale sheet set from the brand is made from 100% pure Pima long staple cotton, fully US-grown, known to be the finest, longest and strongest of fibers. Available in white and ivory, the sheets carry 12 stitches per inch, which contributes to the luxury and crisp feel you get when lying on them. These single-ply 500 thread count percale sheets have deep pockets and can fit mattresses between 9 and 18 inches. Above all, Thomas Lee percale sheets are a perfect choice for those of you with allergies or sensitive skin, because they are not treated with harsh chemicals or resins, and are completely pure and natural. 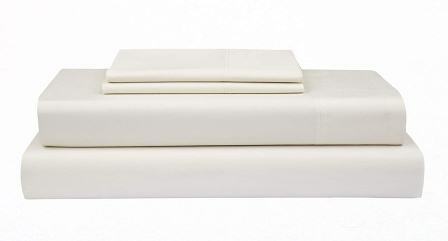 Not to forget, Thomas Lee 500 Thread Count Percale sheet sets come with a 30 night warranty. What this means is that, if you are not completely satisfied with their product for some reason, you can easily exchange or get a full refund, no questions asked. Now that’s a warranty we don’t often see come with sheets. If you tend to get warm or overheat at night, you need sheets that can keep you cool as well as comfortable, which is exactly what you get from Thomas Lee percale sheets. 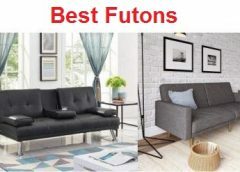 Of course, they are not the cheapest option available out there; but, you are likely to save money in the long run, thanks to their high quality and longevity. Deep pockets up to 18 inches. Suitable for those with allergies and sensitive skin. Peru Pima 415 is manufactured from the best quality Peruvian Pima extra long staple cotton and they offer premium feel and quality. Durability, softness and deep pocket design are three of the key attributes of this type of percale sheets. 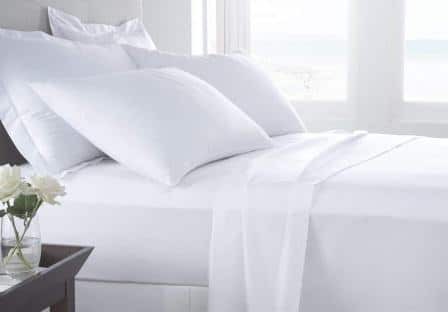 With respect to quality in a percale sheet, best in class material quality is assured when an extra long Peruvian Pima cotton or Egyptian cotton is used. Peru Pima is a household name for percale sheets and the fact that you get a hotel quality sheet for a decent price makes it one of the best products to buy for your home. The 415 thread count of this Peru Pima cotton percale sheets gives us an indication on the level of quality you will get to enjoy from this sheet set. 100% Peruvian Pima cotton is guaranteed by the company and hence you can expect a top class sheet. They are manufactured in Peru, a country world famous for their cotton. The material is extremely soft but also durable, making it a perfect sheet for your bedding, whether it is for your master bedroom, the kids’ room, guest room, or even for the bed in your RV. The percale weave used in these sheets is unique, giving the sheet a luxurious feel and it also helps maintain it cool even during hot summers. 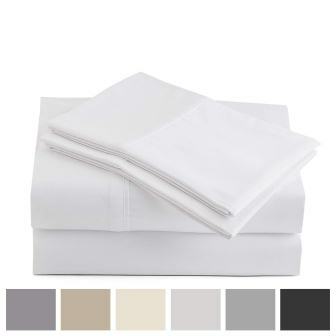 The crisp and smooth nature of this sheet set gets much smoother with every wash. It also has deep pockets, which is almost 14 inches long, and the pillows and sheet come with a 4 inch hem. As a result of this, you should have no problem in making them fit for your bed. However, if the thickness of your mattress is higher than this, you may want to choose a sheet with 16- or 18-inches deep pockets. The Peruvian Pima extra long cotton gives it a matte and silky finish. It comes in 7 different color shades and you can choose the one as per the interior color and décor of your rooms. The breathable fabric allows you to enjoy a relaxed night without getting affected by the heat. If you are used to sleeping on unbreathable cotton-based sheets, then you will be amazed by the feel and comfort you experience with this sheet. Does not pile or fade easily. Low tumble dry machine friendly wash setting. Shrinkage issue does concern some. Only 14 inches deep pocketed. Might not be suitable if you have sensitive skin. Egyptian cotton and Peruvian cotton are two of the most famous and reliable percale cotton sheets in the market and this Kotton Culture sheet set being a 1000 thread count Egyptian percale quality, you can be rest assured that you get the best premium quality fabric. If you are mainly looking to achieve quality, durability, and softness then you should buy a premium Egyptian cotton percale. Buying this percale sheet for your bed will make you feel luxurious. Enjoying a comfortable night’s sleep is very important for your personal and professional life; hence, making use of a high quality Egyptian percale sheet will give you that well-deserved rest every single day. The 1000 thread count Egyptian Cotton sheet set offered by Kotton Culture delivers super smooth sleeping experience due to its lightweight design and comfortable texture. The satin weave creates smoothness and sheen. The fabric is breathable and comes with a button closed duvet cover, which is likely to blend well with your décor as well. Kotton culture 1000 thread count Egyptian Cotton percale comes in 16 different colors, and this offers great flexibility. Similarly, it is also available in 5 different sizes suitable for different bedding options. The tightly woven fabric is hypoallergenic, which is perfect to get rid of dust mites and other allergens, giving you a healthy place to relax without having to worry about allergies. When you buy this percale sheet online, you get a single duvet cover and a set of standard size pillow shams. Duvet inserts are not offered and should be bought separately. This percale sheet is finished in sateen, which makes it expansible. Another exciting aspect of this sheet is that, both the sheet and the bag used to carry it are made of 100% bio-degradable and reusable eco-friendly material. Make sure to wash these sheets as per the washing instructions that come with them in order to maintain their longevity. High quality Egyptian Cotton percale. Fading is seen to be one of the major issues. Royal Hotel bedding is one of the leading manufacturers of high quality luxurious percale sheets and all their products are made from 100% cotton, which delivers smoothness and luxury feel throughout. Percale sheets such as this one are made of breathable fabric, which is perfect for having a relaxed sleep, as their main quality is to help maintain a cool and constant temperature in your bed. Abripedic Crispy 300 Thread Count Percale Sheet from Royal Hotel bedding is made of 100% cotton breathable fabric material giving you excellent comfort and luxury. Percale weave is unique and the fabric is made of long stable yarn, making the sheet look and feel upscale. The 300 thread count per square inch means, what you get is a highly durable and long lasting percale sheet for an affordable price. Percale sheets have a distinct one over one woven advantage over the normal sateen sheets and this makes percale sheets the most suitable of all, making them highly durable, smooth and extremely strong. Royal Hotel Abripedic Crispy 300 Thread Count Percale Sheets come in a wide array of sizes and colors to make them suitable for all kinds of customers. You can purchase the one that would suit your interiors and also select based on your liking. The 22 inches deep pocketed design makes it a suitable sheet for mattresses that are 22 inches deep and lower. Pillowcases and flats come with a 4 inch piping and hemming. The sheets are machine washable using a mild detergent in cold water to avoid fading and other damages; however, this happens to be one common issue reported by several users. Overheating leads to shrinkage, which can be avoided simply by washing it in a cold water. Covers up to 22 inches deep pocketed mattress. 300 thread count single ply. Abripedic trademark warranty against all defects. Fading is a common problem. Tends to shrink over time. California Design Den is known for manufacturing high quality percale sheets, which are ethically manufactured in India and shipped worldwide. These sheets are made of 100% organic cotton, and are GOTS certified as well, making them one of the best and eco-friendly percale sheets in the market. The company has made sure that there is no compromise on the premium quality and nature of these sheets. Lying down on these ethically manufactured sheets will make you feel as if you are sleeping in a premium hotel bed. The best quality cotton yarns are used in the manufacture of the percale sheets, offering you superior quality and sleep performance. As mentioned before, California Design Den manufactured luxury collection is made of 100% organic cotton, which is why the sheets offers superior quality and class. Percale cotton weave is intricate and unique, which makes the sheets smooth and perfect for sleeping all night long after a long day’s work. Sheets are manufactured from long staple cotton fibers, which adds extra smoothness, makes it lightweight, and also durable. These hotel quality organic percale sheets are also priced attractively, making it one of the perfect choices for those of you looking for a comfortable, luxurious, and totally organic sheet with a reasonable price tag. The sheet is OEKO-TEX certified standard 100, which makes it harmless and safe for you and your entire family, even for those with allergies. Organic farming is used to manufacture the sheets, which means it an eco-friendly product as well. The packaging you get the product in is also made from 100% bio-degradable material. All the sheets come with a head and foot tag as well, making it easy for you to set it up. Percale sheets are available in different sizes such as Queen, King, California King, Full, Twin and Twin XL. 5 different colors are offered, which is limited when compared to other sheets that offer many more. GOTS certified 100% organic fibers. Wash with care or follow manufacturer’s washing instructions to avoid fading and shrinkage, two common issues with the sheets. Pinzon 300 Thread Count percale sheet is much better than any other sateen based sheets, which are not as breathable and comfortable like a percale sheet. Though the product doesn’t come with all the bells and whistles, it is certainly one of the best percale sheets available. The cool, breathable, and crisp quality of the fabric makes it an ideal choice, especially for those living in a tropical climatic condition. Pinzon Percale Sheet 300 thread count is made of 100% cotton and the fact that it is uniquely percale woven makes it a highly smooth and comfortable option available out there. This sheet is considered to be thick compared to other percale sheets in the market, but it is the added thickness that is thereby responsible for providing the comfort and durability you expect. The tight percale weaving is also known to resist piling because of its tight and unique weaving pattern. The 12 inch deep pockets will fit into most of the 12 inch mattresses and lower; however, this number is low when compared to many other sheets that have made it on our list. You can get these sheets in 5 different colors and 6 different sizes. This range might not be extensive enough for some of you. Pinzon 300 thread count percale sheet is thicker, which means if you have a thick mattress, this sheet will not be the ideal choice. It will be a perfect fit on a mattress with reduced thickness. The all-around elasticized fitted sheet keeps the sheet in place all night. The flat sheet is oversized and bigger than some of the other ones in the market. The hem stitching is found to be off in some places, which is one of its major drawbacks. Some customers have even complained about some twists that never straightened. Pinzon 300 TC percale sheet will be the best choice for people looking for an oversized top sheet with an affordable price tag. Comes with a fully elasticized fitted sheet for perfect fit. Stitching is found to be off in some places. 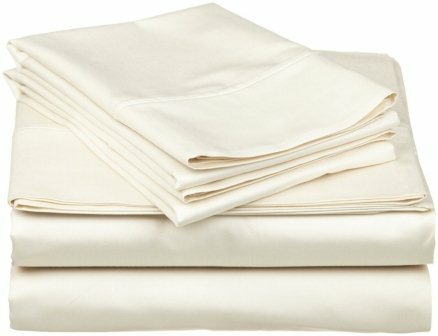 Boston Linen Co. is a reputed percale sheet manufacturing company and the most exciting aspect of this company is that, they manufacture all their sheets in-house. Boston Linen Co. is a rich country brand with over 50 years of textile industry backing them and since this is a family run business, they manufacture premium 300 TC percale sheets that are affordable. One exciting aspect of a percale sheet is that it tends to get softer with every single wash and delivers a cool and airy feel, which is something you can expect from this product as well. Boston Linen Co. uses 100% extra long staple cotton sourced from South Asia, which is perfect for bedding and this ensures superior quality and comfort in the sheet set. Deep pocketed design to fit up to 17inch thick mattress is a positive that can be counted. The hem of all the sheets are subtle and it is very easy to find the right side. All the sheets are manufactured in-house and everything is done by hand following a stringent 5-point quality check. The sheets are OEKO-TEX certified, which makes it one of the safest and chemical free percale sheets around. The 300 thread count percale sheet of Boston Linen Co. is made from 100% cotton and the tight percale weave gives it the strength and smoothness. You might find this fabric less glossy than a sateen woven sheet, but this is extremely soft and durable, which is exactly what you need from your bedsheet. 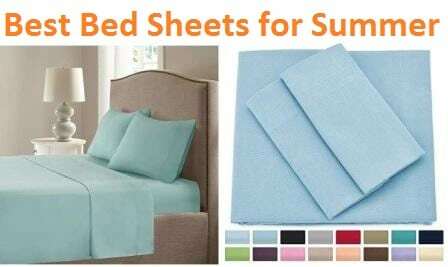 With this percale sheet, you get a pair of pillow cases, fitted sheet and a flat sheet. The package that you get the sheet in is made of 100% recycled craft material. The sheet is available only in 2 different sizes and 4 different color choices, which might not attract some buyers. When you do wash, make sure to set the temperature at the lowest setting and if you decide to use a dryer, choose the lowest setting as well. Bleach is not recommended, since it could damage the gentle fabrics. Wrinkles and shrinkage over time. Only available in 2 different sizes and 4 colors. Rajlinen 100% percale cotton sheet set is one of the most versatile percale sheets you could find in the market mainly because of the wide range of sizes and colors on offer. Users will be spoilt for choice when surfing through their color range. Rajlinen 400 thread count percale cotton sheet set belongs to the affordable range of percale sheets you can buy in the market. Some of you might be tempted to buy a 1000 thread count percale cotton sheet, but, as discussed earlier, sticking to a 300 to 500TC range percale sheet is more than enough. Rajlinen 400 thread count percale cotton sheet set is made using premium quality 100% cotton fabric, which is tightly woven for extra softness and durability. The extra long fiber cotton used in the manufacture gives you a good night’s sleep, which is likely to make you feel like sleeping on your favorite cotton shirt. The 400 thread count percale sheets not only offer a relaxed sleep, they are also known to last longer. As with most of the percale sheets available in the market, even this one offers you superior comfort. As mentioned before, this percale sheet comes in a wide range of sizes and colors, giving you the opportunity to mix and match as per your liking. The different color options also mean you can buy the color you need to suit different room themes. 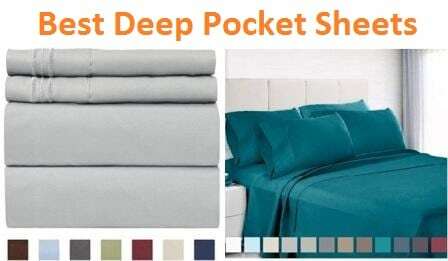 The sheets are available in different deep pocket configurations such as 12, 15, 18, 21 and 24 inches, which is something you could rarely see in a bedsheet. In the package, you get a fitted sheet, a flat top sheet and a pair of pillow cases. Wide range of colors and sizes. Prone to shrinkage or wrinkles. 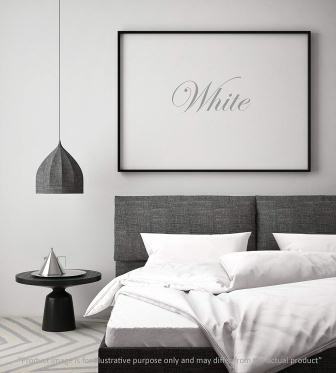 If minimalistic colors and designs is your style, then Purity Home is a brand you will love. With quality as the basis for all their operations, the brand produces extraordinary products, made from superior quality materials, aimed at providing customers with a feel of more natural living. 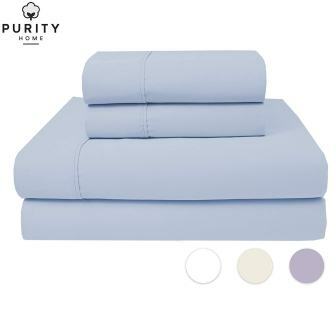 This sheet set from Purity Home is made from 100% combed cotton, available at a great price. 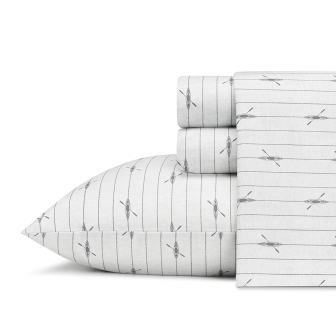 As mentioned, this sheet set from Purity Home is made from 100% combed cotton, which retain long cotton fibers. How the combed cotton benefits the sheet is, it makes it strong and soft, enabling it to last much longer. With the percale weave, this 100% combed cotton sheet set feels crisp and cool against the skin, and therefore, this will be the ideal addition to your bed during those warmer months. The sheet set is available in four different colors: lavender, ivory, aqua, and arctic white, and four sizes: twin, full, queen, and king. The Purity Home percale sheet set comes with a True Grip patented fitted sheet, which can be used to cover mattresses of thickness 7 to 18 inches. The super soft luxurious feel you get from this 300 thread count percale sheet is the result of quality craftsmanship, and the fabric used is harmless, which means it is safe for the environment as well as your skin. The sheet set is also easy to wash and care, as it can be machine washed and shade dried. Additionally, the Purity Home percale sheet set is OEKO-TEX certified, and the overall fabric is highly breathable and soft. The product comes with a one year, no questions asked 100% money back guarantee, which is yet another highlight. Harmless for environment and skin. The sheet may be a little too thin according to some customers. Mellanni Fine Linens, as the name suggests, the company has been producing bed linens of the finest quality that are carefully crafted to provide users with satisfying sleep. The brand focuses on delivering best quality products at affordable prices, and surprisingly, it does just that. Mellanni products, which include bedding and accessories, are some of the best in the market and do not break your bank either. This 300 thread count percale bedsheet set from Mellanni is made from 100% cotton fibers, the airy and crisp nature of which provides you with amazing comfort and luxurious feel. The sheet set is available in four different colors: white, ivory, gray, and light gray, and in four sizes only: full, queen, king, and California king. One of the very few brands that promises “hotel-grade luxury bedding experience” is Mellanni, and the brand maintains its promise with this 100% Cotton Percale Bedsheet Set. Also, this is one of the few percale sheets that are OEKO-TEX certified, which further adds to the quality, credibility, and durability of the product. The sheets are breathable, designed to fit perfectly, fade resistant, and highly durable. However, the deep pocket fit of these sheets can fit mattresses up to 16 inches only, which is relatively low when compared to other sheets in the range. Even this downfall can be overlooked, thanks to the company’s Lifetime Satisfaction Guarantee, which gives you the ability to return their sheets and obtain a refund, no questions asked, at any time. Lifetime moneyback guarantee, no questions asked. Deep pockets up to 16 inches only. Originally an outdoor clothing, gear, and accessories brand catering both men and women, Eddie Bauer is now a reliable name in home linen products as well. The Cotton Percale Sheet Set from the brand assures a beautiful night’s sleep with complete comfort and relaxation. 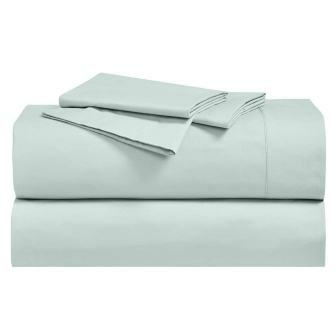 The Eddie Bauer Cotton Percale Sheet Set is made from 100% cotton, and is cool and lightweight. With a thread count of 200, the sheet is crisp, cool, and comfortable, making for a peaceful night’s sleep. When it comes to design, the uniqueness of this sheet is that it comes with some cool prints, such as fishing flies, downstream, sea planes, and more. However, the sizes are limited to only four: twin, full, queen, and king. With a sheet pocket of 15 inches, the Eddie Bauer percale sheet can fit mattresses with up to 18 inches thickness. The soft, cool, and crisp nature of the sheet makes it a great option for those with sensitive skin as well. The sheet is easy to care, washes well, doesn’t lose its color, and has great construction. The Eddie Bauer sheet set, however, doesn’t seem to come with a warranty. No warranty to be found. Known as one of the best linen companies in the market today, Linen Home manufacture their products with the finest quality and yet manage to provide them to customers at reasonable prices. This particular percale sheet set from the company is certainly worth what you pay for, which is actually lesser than many other sheets on our list. Like all Linen Home products, these percale sheets are also made from 100% finest cotton fibers, which makes the sheets less chunky without compromising on their longevity. Of course, as always, the percale weave makes the quality of the fabric much stronger. This sheet set is also available is a wide range of colors and sizes, some of which are pink, charcoal, taupe, baby blue, sea foam, queen, twin XL, and king. The best aspect of this Linen Home Percale Sheet Set is that it is OEKO-TEX tested, which makes it safe for human body, as it contains no harsh chemicals. Furthermore, the sheet is also hypoallergenic and therefore unlikely to trigger any sort of allergic reactions, thus keeping you and your family safe. 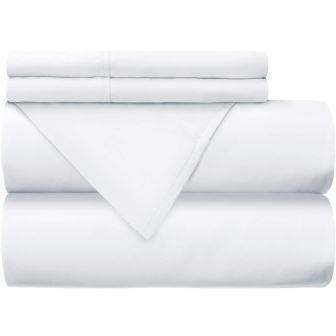 The sheet, overall, is crisp and airy, gets softer with each wash, and is easy to care as well. However, its deep pocket can only fit mattresses up to 16 inches. Deep pocket up to 16 inches only. Though Superior is not a much well-known brand when it comes to percale sheets, they do produce a lot of good quality products, which are used and loved by consumers across the country. This particular sheet is known for its subtle softness and is a great catch for the price. 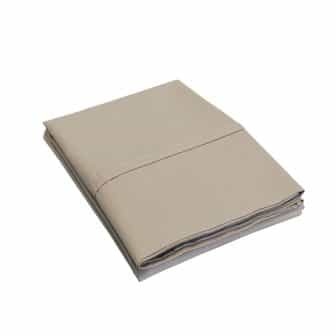 Made of 100% premium quality cotton, which contributes to its subtle softness and easy maintenance, the Superior percale sheet comes with a 300 thread count, and is available in various colors and sizes, including lilac, sage, tan, burgundy, twin XL, split king, California king, and full. The percale weave makes the sheets breathable and crisp. These single ply percale sheets are marketed to be easy to care, which actually happens to be true. The sheets are machine washable and require little maintenance, which makes them perfect for every household. 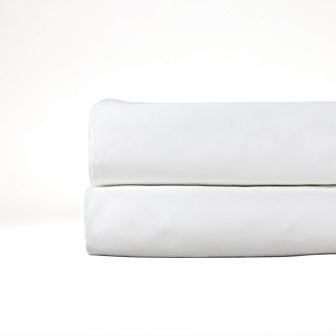 Additionally, the Superior percale sheets come with deep pockets that can fit mattresses up to 18 inches thick. Despite these features, one prominent downfall of these sheets is that they seem quite thin when compared to the other products on our list, and they tend to shrink as well. Sheets are a bit thin. Established in 1994, Linenwalas is a brand that excels in delivering quality in all of its products, which not only include bedsheets, but also other housekeeping products. Their products are known to be shrink resistant, dust resistant, and come with good absorbent capacity. The Linenwalas Percale Sheets are made from 100% organic cotton, and as the name suggests, the sheets carry crisp percale weave. With 300 thread count, the sheets are available in different sizes and colors, such as king, California king, short queen, ivory, silver frette, navy blue frette, and more. What makes these percale sheets from the brand Linenwalas stand out from the rest is their Global Organic Textile Standard (GOTS) certification, which testifies the use of organic cotton to make the sheets. The sheets, however, can fit mattresses with thickness ranging from 6 to 16 inches only. These sheets are shrink-resistant, cool, and soft, all of which together make them good quality sheets you can rely on. 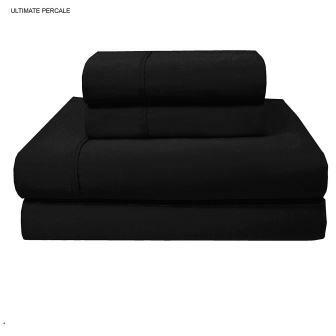 Ultimate Percale is a brand known for producing great products by the use of modern processes and technologies, and the company aims at delivering “all-encompassing sleep experiences”. This end-to-end bedding provider is known for their quality bedding collection, which are known to be highly genuine. 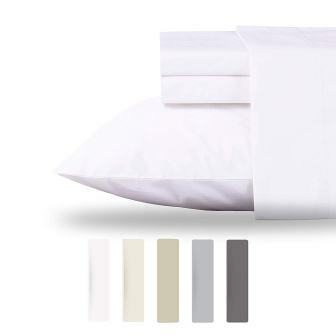 This is a 400 thread count percale sheet set made from 100% cotton, from the finest cotton fibers, which contributes to the soft, smooth, cool, and comfortable sleeping experience. What makes these sheets unique is the 4-inch Z hem, which makes evident the craftsmanship involved in providing that luxurious feel you look for in percale sheets. The Ultimate Percale 400 Thread Count Sheet Set is capable of fitting mattresses up to 17 inches. Though this number is relatively low when compared to many other percale sheets on our list, it should suffice for the mattresses owned by many. One of the highlights of this sheet set is that it is available in a variety of colors, including sage, yellow, taupe, ocean blue, ivory, and black. Also, since the products from the brand are individually inspected for defects, they offer a 1 year no questions asked 100% money back guarantee. Sheets tend to wrinkle after wash.